Greenville City Schools is excited to provide a new learning opportunity for staff and students. As a District, we are committed to preparing students for the 21st century and equipping them with necessary tools to be college and career ready. Technology has become an increasingly critical educational tool as access to knowledge and learning are expanding over the web. Additionally, the demands of the workplace are changing. As we expand the use of technology districtwide, students can expect to have a learning environment that integrates today’s digital tools, accommodates a mobile lifestyle, adapts to individual learning styles, and encourages collaboration and teamwork. Arcanum Faith United Methodist Church is announcing the retirement of Pastor Tim Pieper. He and his wife, RaeAnn have been ministering at Faith UMC for the past three years. The Piepers are moving to Utah to be an important and integral part of their six young grandchildren's lives. Faith Church thanks them for their ministry and wishes them much happiness and joy. A.R. WINERY CELEBRATES THEIR 3rd ANNIVERSARY WITH A FALL FESTIVAL! A.R. Winery is excited to celebrate their 3rd anniversary with a Fall Festival on Saturday, September 1st from 2pm-10pm located on their farm at 3564 Gordon Landis Rd. in Arcanum (just 2 miles off Route 49)! Come browse the many vendors, listen to live music and enjoy great food & wine with friends. A.R. Winery will be presenting a check to the Darke County Dog Park “Scentral Park” from the Fuel funds raised in the tasting room throughout the year. The donations will help maintain the grounds and keep the park looking fabulous for all to enjoy! On the winery porch, they’ll be cooking wood-fired brick oven pizzas and selling pulled pork sandwich platters from Winner’s Meats. In the wine tasting room, they’ll be offering their one-of-kind wines, pina colada wine slushies and drunken gummies. A few of the vendors include Scentsy, jewelry, crafts, a farmer’s market and much more throughout the day. Check out Facebook, their website www.arwinery.com, follow them on Twitter @a_r_winery or Instagram @ a.r.winery or call Russell at 937.417.0565 to keep up-to-date on all events happening on the farm! Fort GreeneVIlle Chapter DAR, a 50th Anniversary Vietnam War Commemoration Commemorative Partner, proudly escorted Vietnam Veterans in the 2018 Great Darke County Fair Veterans Parade. Also in attendance was the American Revolutionary War Patriot Mime that posed with DAR members. 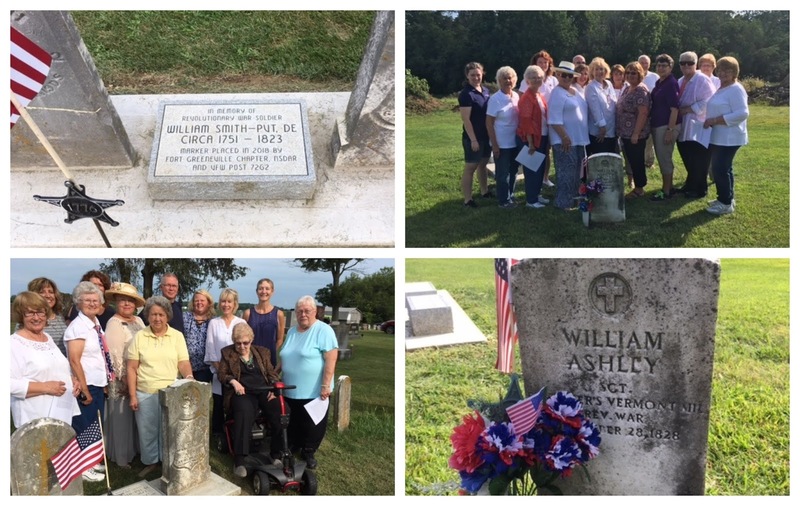 Fort GreeneVille Chapter DAR and VFW Post 7262 re-dedicated the marker of American Revolutionary War Soldier William Ashley at Ithaca Cemetery. Ashley was a Sergeant in the Vermont Militia. Another dedication was held at Stelvideo Cemetery for newly proven American Revolutionary War Soldier William Smith. Smith served in the Delaware Militia for six years and was ranked a private. Descendants of Ashley and Smith, along with members of the Arcanum Historical Society were in attendance. The Pitsburg Church of the Brethren will sponsor an Old Fashion Hymn Sing on Sunday, September 2, 2018 at 6:00 PM. This event is offered to the public in keeping with the church’s monthly Gospel Concert Series. The public is invited to come and request their favorite hymns be sung by the congregation. Whether you are a ‘singer’ or a ‘listener’, it’s an evening of great music and fellowship. Feel free to come and challenge our pianist and enjoy some of the old hymns that are not necessarily sung in today’s services. The church is located at the west edge of Pitsburg @ 8376 Pitsburg-Laura Road. VFW Post 7262 Junior Vice Commander Don Dietrich presents a check to Empowering Darke County Youth Program Coordinator Bob Robinson to help support Empowering tutoring programs. GREENVILLE – Greenville VFW Post 7262 Junior Vice Commander Don Dietrich presented a check to Bob Robinson, program coordinator for Empowering Darke County Youth. The donation will be used to help support Empowering’s After School Program. The presentation was made at the Coliseum at the Great Darke County Fair. The Post had T-shirts, hats and other memorabilia supporting the VFW efforts in the community. The VFW is a charitable organization that focuses on veterans and their families, as well as supporting its community. It offers a wide variety of events for its members as well as the public. The Ruth & Emerson Booher Advised Fund for Versailles, Ohio, in conjunction with The Dayton Foundation, recently awarded a grant to Big Brothers Big Sisters of Shelby & Darke County. The grant will be used for the Versailles Big Buddies after-school mentorship program. 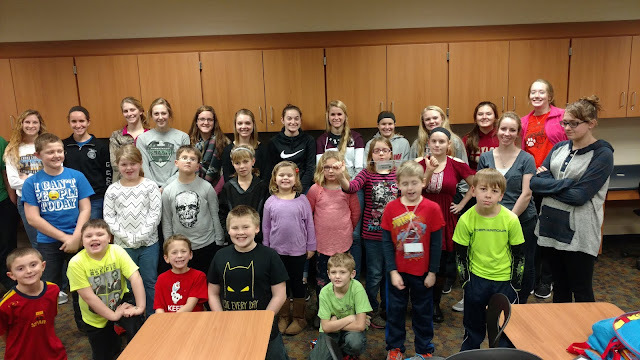 Big Buddies is a nine-month commitment where high school students volunteer two times per month to mentor elementary students. During these meetings, high school students, under the supervision of Big Brothers Big Sisters staff, work with one or two children on different educational and recreational activities. This year’s program will focus on “Mindfulness: Healthy Minds, Healthy Bodies”. Last year, Big Brothers Big Sisters served 210 students under the age of 18 in their after-school Big Buddies programs throughout Shelby and Darke counties. High school mentoring programs have become a widespread component of many nationally affiliated Big Brothers Big Sisters agencies. Studies prove that children who spend time with a positive role model are more likely to become healthy, productive adults. This donation will allow Big Brothers Big Sisters of Shelby and Darke County to expand and continue their Big Buddies program in Versailles. Big Brothers Big Sisters is a non-profit United Way member agency. If you would like to make a difference in the life of a child, either through volunteering or financial contribution, please contact the agency at 937-492-7611, 937-547-9622 or go to www.bigbrobigsis-shelbydarke.org for more information. Greenville Public Library is now offering cardholders free access to online educational courses from Lynda.com. September is National Library Card Sign-up Month, but you don’t have to wait. Sign up now for a Greenville Public Library card and start learning with Lynda.com. For patrons needing assistance signing on and using Lynda.com, they can schedule an appointment with Warren Richards by calling the library at 937-548-3915 or e-mailing warren@greenville-publiclibrary.org. Tired of looking at those old tires lying around? Not only are they an eyesore, they can be dangerous. The Darke County Solid Waste District and the Ohio EPA want to help you with your tire problem. The district and EPA will be sponsoring a used tire collection on Wednesday, September 26, 2018, from 9:00 a.m. to 5:00 p.m. In addition to tires to being an eyesore, they are a nuisance to rural citizens who find them in their ditches, out in the fields and wooded areas. Used tires make the perfect breeding ground for mosquitoes that can carry diseases such as West Nile Virus, Zika, Lascrosse Encephalitis, St. Louis Encephalitis, Dengue and Yellow Fever. Some mosquitoes have long-lived eggs, which can remain unhatched for years in old tires that were once wet and have dried out. The eggs can be transported in tires that are trucked between counties, states and even countries. When it rains, these tires collect water, wetting the inside of the tires where the eggs once were deposited, hatching out mosquitoes by the thousands. By disposing of used tires properly, we reduce the chance of disease. The Tire Recycling Day is open to all Darke County residents, farmers, municipalities and townships. Unfortunately, no tires will be accepted from junk yards or junk dealers, garages, auto repair shops; tire, automobile, truck, farm-equipment dealerships; atv/motorcycle shops or commercial trucking/hauling businesses. Those interested in participating in this one-day event must pre-register. Pre-registration begins Wednesday, August 29, 2018, from 8:30 a.m. to 4:00 p.m., at the Darke County Solid Waste District, 684 Wagner Ave, Suite C, Greenville (behind Edward D. Jones and Sidney Dental; beside Greenville Federal.). Pre-registration ends on Wednesday, September 12, 2018. Participants must provide a valid driver’s license or state-issued identification and sign a waiver that the tires being brought for recycling are from a residence in order to participate. On September 3, 2018, the district will be closed due to the Labor Day holiday. Participants are asked to remove rims from all tires before taking them to Rumpke Transfer Station at 5474 Jaysville-St John Rd, Greenville, on September 26, 2018. Those tires left on rims will not be accepted. Passenger tires will be accepted at a $1.00 a tire. However, there is a limit of 15 tires per Darke County address. Tractor tires pre-registered will be charged a $15.00 fee per tire at the time of registration. Tractor tires larger than 28” wide will not be accepted. Semi/truck tires pre-registered will be charged a $5.00 per tire fee. Payment is due at the time of sign-up in the form of cash or check. The Ohio EPA requires a transporter’s permit for those hauling more than 10 tire at a time. According to the Ohio Revised Code, all tires must be secured and tarped before arriving at the transfer station unless they are in an enclosed vehicle, trailer, etc. Untarped loads can be refused. Also, the Ohio EPA requires a transporter’s permit for those hauling more than 10 tire at a time. Assisting the Solid Waste District and Policy Committee will be Community Service workers, the Environmental Division of the Darke County Health Department, Darke County Engineer, Darke County Highway Garage, Rumpke employees and many volunteers. Greenville Union Cemetery recently placed a VA marker for Civil War Soldier Denise Denise. DAR member Caroline Petitjean noticed Denise’s grave was unmarked when counting the graves for their “Wreaths Across America” project in the Soldiers Section of the cemetery. Fort GreeneVille Chapter of the Daughters of the American Revolution assisted the cemetery in applying for a government issued marker. 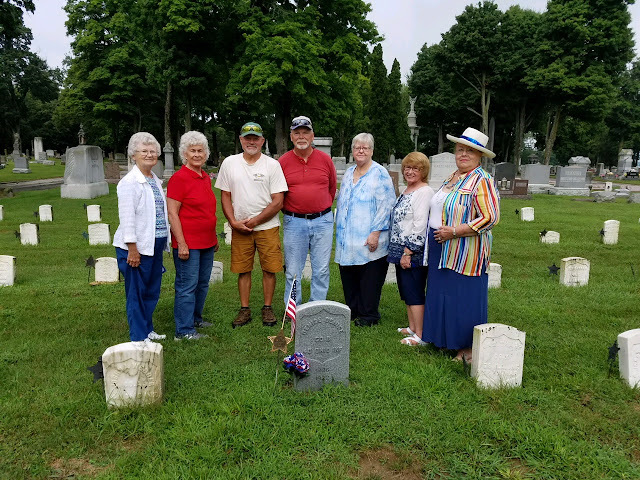 Fort GreeneVille DAR and Greenville Union Cemetery were honored to work together to recognize Denise’s service to his country. A GAR flag holder, flag and flowers were placed on his grave. Fort GreeneVille DAR is still taking donations for "Wreaths Across America" at Greenville Union Cemetery. There are many Veteran markers that still need wreaths. Local volunteers are working hard to ensure that all veterans laid to rest at Greenville Union Cemetery are honored this December on National Wreaths Across America Day. This year, the ceremony, held simultaneously across the country at more than 1,200 locations, will be on Saturday, Dec. 15, 2018. The goal: to place a live, balsam fir wreath at the headstone of every veteran buried there and spread patriotism and commemoration for the ultimate sacrifices they made for our country. From now until November, volunteers will host various fundraisers to sponsor the approximately 2000+ wreaths needed to honor every veteran at the Greenville Union Cemetery. Each wreath sponsorship costs $15, with $5 going to the local fundraising group, Fort GreeneVille DAR, as part of a special fundraising program developed by Wreaths Across America. Fort GreeneVille Chapter will use monies raised to continue the wreath program at Greenville Union Cemetery and various local Veteran projects. National Wreaths Across America Day is a free event, open to all. For more information, to donate or to sign up to volunteer, please visit www.WreathsAcrossAmerica.org. Wreaths Across America is a 501(c)(3) nonprofit organization founded to continue and expand the annual wreath-laying ceremony at Arlington National Cemetery begun by Maine businessman Morrill Worcester in 1992. The organization’s mission – Remember, Honor, Teach – is carried out in part each year by coordinating wreath-laying ceremonies in December at Arlington, as well as at more than 1,200 veterans’ cemeteries and other locations in all 50 states and beyond. This free music class is an opportunity to show our young parents of the Greenville community how we love Jesus at St. John Lutheran. 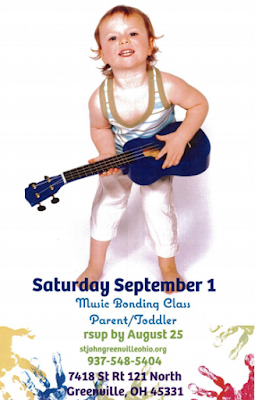 This class is designed to encourage parents of toddlers. These parents and children will enjoy bonding through the language of music expression. It will engage physical, mental, emotional, social and spiritual bonding. This 30 minute class is open to parents with 1, 2 or 3 year olds. Contact Suzi Fischer for more details. God has shown us love through music as one of our greatest gifts that you could give your child and one that will last them a lifetime. The Darke County Center for the Arts will hold its annual meeting on Thursday, September 6, 7 p.m., in the Reference Meeting Room on the second floor of the Greenville Public Library, 126 W. Fourth St., Greenville. All DCCA members are invited to attend. The agenda includes election of officers and trustees and reports from the last fiscal year. Immediately following the annual meeting, the board of trustees will convene for their regular monthly meeting. Darke County Center for the Arts encourages cultural enrichment in the community by presenting high quality performing and fine artists. In addition to offering an Artists Series and a three-performance Family Theatre Series at Henry St. Clair Memorial Hall, DCCA presents Special Performances, a Coffee House Series at local venues, and Arts In Education outreach programming which brings professional performers to inspire creativity in the students of all Darke County Public and Greenville City Schools. Additionally, a summer theater residency is offered for local youth. Darke County Center for the Arts is also committed to the preservation of Henry St. Clair Memorial Hall and welcomes all patrons regardless of race, color, religion, socioeconomic background, or physical impairment. The beautifully restored, historic Henry St. Clair Memorial Hall offers an access ramp, handicapped-accessible restrooms, and accommodations for wheelchairs, as well as maneuverable space in halls, aisles, and the Anna Bier Gallery. The elevator uses Braille as well as traditional lettering, and upon request, hearing aid devices are available, for the hearing impaired. Also, interpretive signers are provided upon request for all performances. DCCA is committed to making the arts accessible to all, and will do its utmost to accommodate special needs. For more information on the Darke County Center for the Arts contact our office on the third floor of the Greenville Public Library, (937) 547-0908 or visit DarkeCountyArts.org. The cast of Snow White & the Seven Dwarfs performed at St. Clair Memorial Hall. 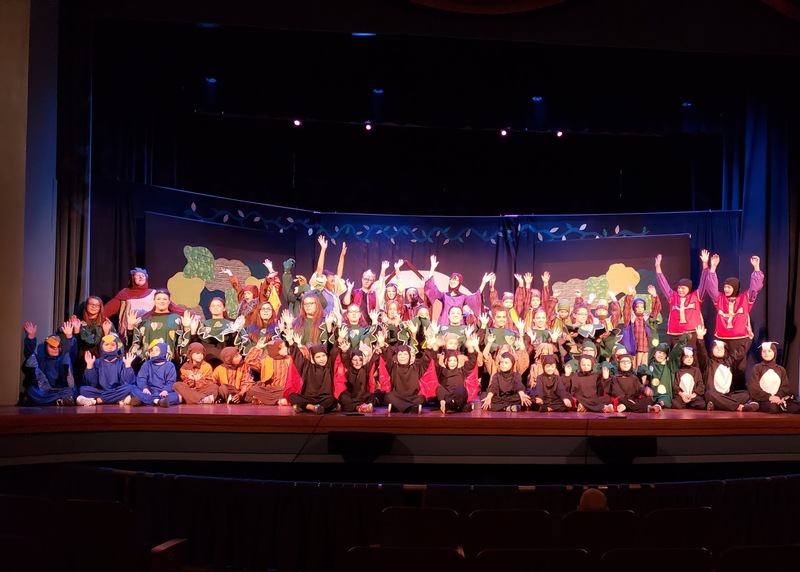 In one short week the Missoula Directors cast, rehearsed and presented the musical Snow White & the Seven Dwarfs, featuring 60 local students from grades 1-12 in roles from the familiar tale with a Missoula Theatre twist. On Saturday, August 4th the cast performed two productions at St. Clair Memorial Hall for a delighted audience. The purpose of Darke County Endowment for the Arts is to keep the Arts alive forever in our community. Darke County Endowment for the Arts is a non-profit organization that receives and manages charitable gifts, which are invested to produce income to benefit the Arts in Darke County. The Endowment assists donors in fulfilling their charitable wishes, creating lasting legacies to enrich lives through the Arts for years to come. Darke County Endowment for the Arts is managed by a Board of Trustees made who meet regularly to manage investments and consider appropriate action to assist the Arts in Darke County as funds are available. Current trustees are Gary Brown, Marilyn Delk, Roberta Feltman, Barbara Greiner, Becky Hartnagle, and Andrea Jordan; Nicki Gillespie serves as treasurer. For more information or to make a donation to the Darke County Endowment for the Arts visit www.SupportDCEA.org or P.O. Box 155, Greenville, OH 45331. Snow White & the Seven Dwarfs was also made possible thanks to the Ohio Arts Council, local foundations and DCCA Memberships. Trees are all around, yet many do not know a maple from an oak. As the leaves begin to change their color and drop for the season, the identification can become tricky. Join a naturalist on Tuesday, September 4 at 6:30pm at Shawnee Prairie Preserve Nature Center for an informative program to learn how to identify a tree through its bark, leaf, and growth patterns. The workshop will finish by heading outside to practice the newly learned skill. Registration is requested for this free event. For questions about this or any other park district programs or to register for the class, please call 548-0165.
with intern Brandi Brumbaugh to spark curiosity. On Saturday, September 8 @ 10am Darke County Parks invites educators to attend a free program geared towards hands-on, investigative learning. Inquiry is a fundamental tool used to trigger a student’s curiosity along with building confidence, encouraging independent behavior, and strengthening their ability to handle complex problems. This technique can create excitement in the classroom as students take a hands-on approach to learning. Facilitator Kathi McQueen is a naturalist for the park and obtained her graduate degree through Miami University’s Project Dragonfly which utilizes inquiry and participatory education approaches to enhance learning. This program will be held at the Shawnee Prairie Preserve Nature Center and registration is required. Please call 937-548-0165 if you would like to register or have additional questions. 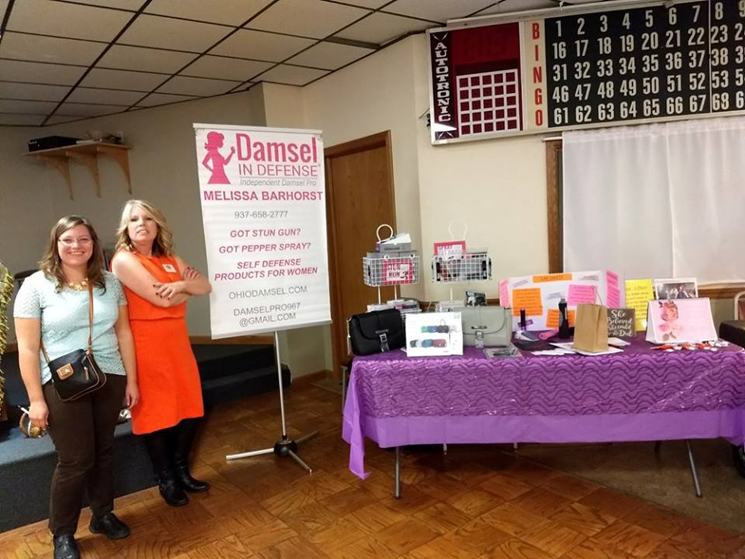 Greenville, OH August 21, 2018 – ‘What a Girl Wants’ is the theme for this year’s Greenville Business & Professional Women’s (BPW) Club Annual Guest Night which will be held on Thursday, October 11, 2018. The event will start in downtown Greenville from 4-6PM with special savings and surprises at selected merchants to be announced. A new business joining our evening is 4One Apparel located in downtown Arcanum. The faith-based company is run by business partners Sara Waldo and Mandy Flatter. The evening will continue at the VFW, 219 N. Ohio Street, at 6:00pm with more vendors, silent auction, door prizes, fashion show, cash bar, and appetizers provided by J’s Country Market. Ladies of all generations are invited to come, relax, shop and socialize with us! The BPW club will also launch their ‘super raffle’ at the guest night event. The drawing will be held at the Club’s December 13th meeting. The cost for the ‘What a Girl Wants’ evening is $15.00. All proceeds from this fundraiser will go toward scholarships for the young women of Darke County. Last year the club was able to award four local scholarships and is working to increase the number of scholarships offered. More information will be announced in the near future, or you can follow the Greenville BPW Club on Facebook. The Greenville BPW Club’s mission is to achieve equity for all women in the workplace through advocacy, education and information. For further information please contact Guest Night Committee Chair Deb Niekamp at 419/305-2178 or BPW Club President Peggy Foutz at 937/670-6511 or through pafoutz@gmail.com. On August 22, 2018 at approximately 11:40 p.m., officers were dispatched to the area of the 200 block of Anderson Avenue in reference to a report of shots fired. Upon arrival and through investigation, it was determined that a subject in the 200 block of Anderson Ave. discovered subjects tampering with his vehicle which was parked on the roadway. The subject chased the suspects to the 200 block of Riffle Avenue where an altercation occurred. During this altercation, one round was fired from a handgun. Medical personnel were called to the scene; however, no one was transported for medical attention. Music returns to the park with The Greenville Municipal Jazz Band as they perform the second of the Jazz and Pops in the park concert this Sunday, August 26th at the Marling Band Shell area of the Greenville City Park. The concert will begin at 7pm and is free and open to the public. This week the Greenville Municipal Jazz Band takes over the entertainment in the park by presenting an evening of Jazz and Pops music. Selections for the concert will include music from Buddy Rich, Aretha Franklin, Chicago and others. This Evening of Pops and Jazz Concert will also feature other great soloists and section features. Our guest artist for the evening will be Chelsea Whirledge. Chelsea has been a performer with the Municipal Bands for many years. Chelsea is the Vocal Music Director for Greenville High School and director of the Wavaires. She will be singing great songs with the Greenville Municipal Jazz Band such as Blue Skies, Fever, Cry Me a River and the great Adele hit Skyfall. Please plan to attend the Jazz and Pops in the Park concert this Sunday, August 26th at 7pm at the newly rebuilt Marling Band Shell area of our beautiful city park. Bench seating is available and you can bring your own chair or blanket to sit on and enjoy the show. The concert series is a great way to spend an evening listening to music, reading a book or just creating quality time with family and friends. 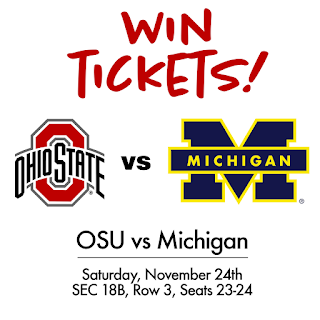 (Greenville, Ohio - August 19, 2018) Mason Knows Mortgages, a Greenville Ohio based mortgage team, is currently offering a chance to win two tickets to the upcoming Ohio State / Michigan Game on November 24th. Seats are located in Section 18B, Row 3, Seats 23-24. The value of tickets in this location is $1,386. Entering is free and open to the public. The winning tickets will be drawn will on Friday, September 4th. To enter, visit the official contest entry page online at: http://masonknowsmortgages.com/contest. Crowell Lawn Service was chosen to receive the Community Commercial Landscaping Award for the outstanding hanging baskets and containers they have planted and maintain at the business on Eidson Road in Greenville. The planting’s is a joint effort with owner Justin Crowell and Mandy Asper. Shown are Angela Beumer and Lisa Marcum Ladybug Garden Club Community Beautification committee members, Justin Crowell and Mandy Asper. Carolyn Hemmelgarn received The Ohio Association of Garden Clubs and Ladybug Garden Club Residential Landscaping Award for August for outstanding design in their gardens on Dorothy Lane in Greenville. The outside reflects a very inviting and relaxing setting with large containers of annual and perennial and flower beds with herbs and water features. Shown are Carolyn, Angela Beumer, Sherri Jones and Lisa Marcum of the Ladybug Garden Club. Roger McEowen was honored by the Ladybug Garden Club for Outstanding achievement in design and maintenance of his residential property at Fox Run apartment in Greenville for the month of August. Roger has been a gardener and grower for many years raising fruit trees, annuals and perennials. Shown are Ladybug Community Beautification members Sherri Jones, Lisa Marcum, Roger and Angela Beumer. Kathy and Kirby Clark were selected as Residential Landscape Award winners as they reside next to Roger McEowen and appreciates the knowledge and help he provides with outstanding gardening. Shown are Kathy Clark, Lisa Marcum, Sherri Jones and Angela Beumer of the Ladybug Garden Club Community Beautification committee. Covington, Ohio – The Manitou Red Tour is stopping at all four Apple Farm Service locations over the next month. The Red Tour event provides an opportunity to try the newest Manitou MLT multi-purpose telescopic loaders and attachments designed for the agriculture industry. An open house and free lunch will be held in conjunction with the Manitou Red Tour at the following Apple Farm Service locations: Botkins, Ohio on Aug. 21; Covington, Ohio on Aug. 28; West College Corner, Indiana on Sept. 4; and Mechanicsburg, Ohio on Sept. 11. With over 30 years of experience in the agricultural telescopic handler market, Manitou is known for delivering maximum comfort, performance and cost efficiency. The Red Tour showcases the versatility of the Manitou MLT Series telescopic loaders and attachments. These multi-taskers boost productivity in digging, lifting, hauling and loading applications on the farm. The Manitou MLT Series features machines that can lift up to 31 feet and attachments that are specific for farm handling tasks such as hay handling, manure scraping, animal feeding, sweeping and more. The Red Tour and open house event runs from 9 a.m. to 4 p.m. at each of the four Apple Farm Service locations. The events are open to the public with free lunch from TIME. The Manitou equipment will remain at each dealership for a week following the event, and customers will have the opportunity to sign up for an on-site demonstration at their own farm. For more information about the event or Apple Farm Service, visit applefarmservice.com or call (937) 526-4851. For Manitou equipment information, visit manitou.com. (Greenville, OH) August 15, 2018 – The Darke County YMCA, in conjunction with Wayne Healthcare Foundation, the Greenville Rotary Club, and local health professionals, is pleased to offer free diabetes education classes beginning September 6. The YMCA encourages residents of Darke County to be aware of their risk for prediabetes and type 2 diabetes and steps they can take to manage the disease once diagnosed. Currently, nearly 26 million Americans have diabetes and one in three (79 million) individuals have prediabetes, a condition where blood glucose is elevated, but not high enough for a diabetes diagnosis. The nation’s struggle with obesity and type 2 diabetes is no surprise, but the amount of people with prediabetes is a growing issue that can be prevented or delayed with lifestyle changes such as healthy eating and physical activity. People with prediabetes are at risk for not only developing type 2 diabetes, but cardiovascular diseases, stroke and other conditions. “The YMCA of Darke County recognizes that changing one’s lifestyle can be daunting, so this course will give you the support and education to help you achieve success in preventing diabetes or to successfully manage the disease,” noted Sam Casalano, CEO. The four-week course will provide participants with weekly education and support on a range of diabetes-related topics including diet and nutrition, exercise, and making healthy choices. Classes will begin Thursday, September 6 and run each Thursday through September 27 from 6:00-7:15 PM. There is no cost to participate; please call the Y at 548-3777 to register. Feel free to bring a partner or friend as a support person. Classes will be held at the YMCA at 301 Wagner Ave., Greenville. Those who attend all 4 classes will receive a complimentary 4 week adult membership to the Y. For more information about the YMCA or to register for the course, please contact the YMCA at 937.548.3777 or visit www.ymcadarkecounty.org. MARIA STEIN, Ohio (August 16, 2018) – On Sunday August 12, the Maria Stein Shrine of the Holy Relics held a Mass of Thanksgiving for the donors who help make the ministry of the Shrine possible. Archbishop Dennis Schnurr celebrated the Mass to recognize the donors who gifted at a specified level. The Mass was concelebrated by Rev. Jeffrey Kirch and assisted by Deacon Clif Perryman, who is also a Maria Stein Shrine board member. After the Mass, guests enjoyed refreshments and the special art exhibit in honor of St. Mother Teresa, located on the 3rd floor of the Shrine and in the newly renovated Upper Room. The exhibit, which is from the Museum of Spiritual Art, will be on display at the Shrine through the end of the year. The Maria Stein Shrine of the Holy Relics provides faith nourishment and spiritual renewal through opportunities for prayer and pilgrimage and inspiration from the lives of the saints. People from around the world visit the shrine to explore and enjoy this environment rich in holiness and history. The Shrine is located at 2291 St. John’s Rd. in Maria Stein. For more event information, visit www.mariasteinshrine.org. Bat populations have seen dramatic declines over the past several years. Due to the impact White Nose Syndrome has had, some species have seen up to 98% winter hibernacula loss. Darke County Parks is participating in the efforts to save these important ions of our ecosystem by participating in bat acoustic surveys and monitoring. We also have the most modern technology for detecting bat echolocation frequencies. Join us for an evening discovering the importance and status of the Bats of Ohio and our role in monitoring local populations. The Bats of Ohio program will begin at Shawnee Prairie Preserve at 8pm. Please pre-register by calling the Nature Center at 548-0165. Rotarians from the Greenville Chapter of Rotary International prepare for the opening of The Great Darke County Fair 2018 with the Rotary Lemon Shake Up Stands training taking place in lieu of their normally scheduled meeting on Tuesdays at noon. 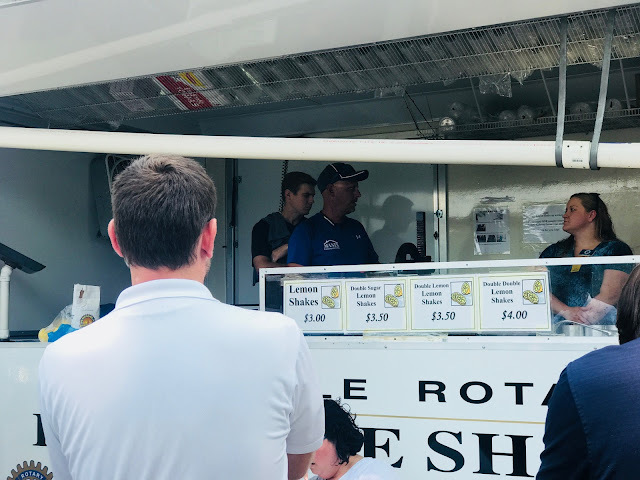 "The Lemon Shake Up Stands are the primary fund raising source for us", states Gavin Glasscoe, current president of Rotary. "This source of funds is a large part of our grant process and scholarships awards given each year. " Literally almost one hundred volunteers are needed to person the two lemon shake up stands. Pictured in the Trailer at center is Rotarian Brad Feldner of Manix Construction training new members of the Greenville Rotary. Brad has been responsible for training and scheduling the members and volunteers needed to operate the trailers for over four years. Glasscoe continues that "We can't thank Brad enough along with our other members for their tireless work done before, during, and after The Great Darke County Fair. Rotary is held every Tuesday at the Brethren Retirement Community Chestnut Street Village Center at noon. If you are interested in becoming a Rotarian and their service to the community please contact Christy Bugher of the United Way or Roger M. Van Frank at the Darke County Park District for further information on becoming a Rotary Member. Bruce Mikesell watches as first- time shooter Katheleen Nealeigh aims. Sixteen people ranging in age from 12 to 75 “learned to shoot like Annie" last Saturday . Many had never held a gun or rifle; others looked to improve their skills. 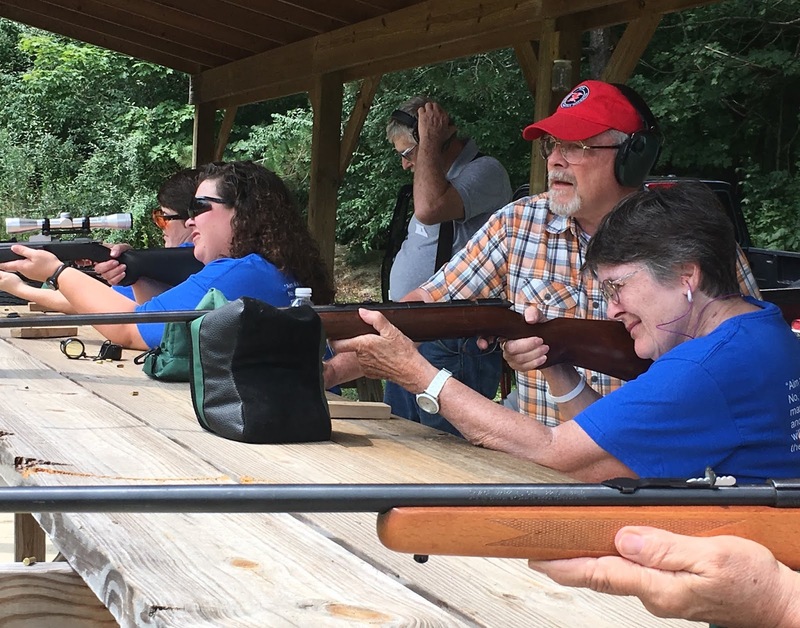 Participants learned about firearms and experienced hands-on practice at the firing range at the Darke County Fish and Game Club in New Madison. This was the first “Annie’s Memorial Shoot” co-sponsored by the Annie Oakley Center Foundation and the Fish and Game Club. It was scheduled on August 11 to coincide with Annie Oakley’s birthday on August 13. The day began with classroom instruction in firearm safety. Wearing protective eye and ear wear provided by Fastenal, participants then practiced shooting on the range with rifles and handguns. Lots of cheers spurred each other on, and bullseyes were especially exciting. Thanks go to the certified, experienced instructors Bruce Mikesell, Bill Wantz, and Mike O’Neal, who volunteered their time. Organizers of the event co-chaired by Brenda Ballengee for the Foundation and Sharre Grubbs for the Fish and Game Club want to thank the additional event donors: Ann’s Gifts, Annie Oakley Natural Perfumery (Ligonier, IN), Buffalo Wild Wings, Cope’s, Eikenberry’s IGA, Fastenal, Christy Gulley’s Girl Scout Troop # 31223, the Ohio Department of Natural Resources, and Subway . Special thanks are in order for the cooks, Terry and Ruth Leedom and Rod Saylor. Will you learn to shoot at next year’s event? The Arcanum Public Library is excited to be hosting a representative from The Coffee Pot in Greenville as he presents a class all about coffee. According to the latest coffee statistics from the International Coffee Organization (ICO), about 1.4 billion cups of coffee are poured worldwide every day. About 45 percent of it (400 million cups a day) is drunk in the United States. That is a lot of java! How much do you know about coffee? Join us for an informative class, “Seed to Cup”, on Thursday, September 6 at 6:00 p.m. to find out. Learn while tasting! Patrons can call to register for this free class, or come to the library to sign up. Patrons can call the library at 937-692-8484 with questions, check out the website at www.arcanumpubliclibrary.org, find the library on Facebook, or follow on Twitter. Garst Museum thanks Fitzwater Tree and Lawn Care for its continued support of The Gathering at Garst. Fitzwaters cleaned, mulched, and pruned the landscaping at the entrance to Garst Museum. The flower beds were pristine as the museum welcomed approximately 15,000 people to The Gathering at Garst, the annual July spectacular. 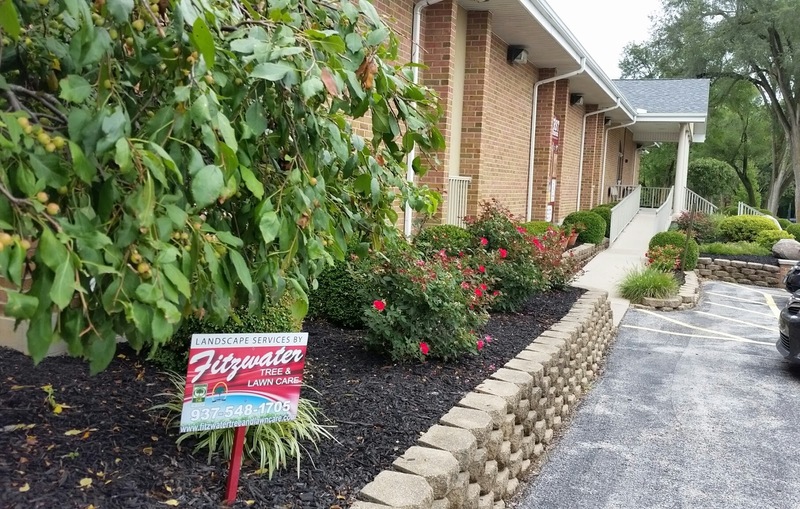 The museum is very grateful for Fitzwater’s help in beautifying the museum grounds. The Gathering at Garst made history in July as it welcomed 15,000 people to the grounds of Garst Museum. Visitors celebrated the history of Annie Oakley, Lowell Thomas, and Chief Little Turtle. Helping to make it a huge success were sponsors like KitchenAid. Visitors to our community not only enjoyed The Gathering at Garst but also shopped the sales in downtown Greenville--especially the legendary KitchenAid sale. 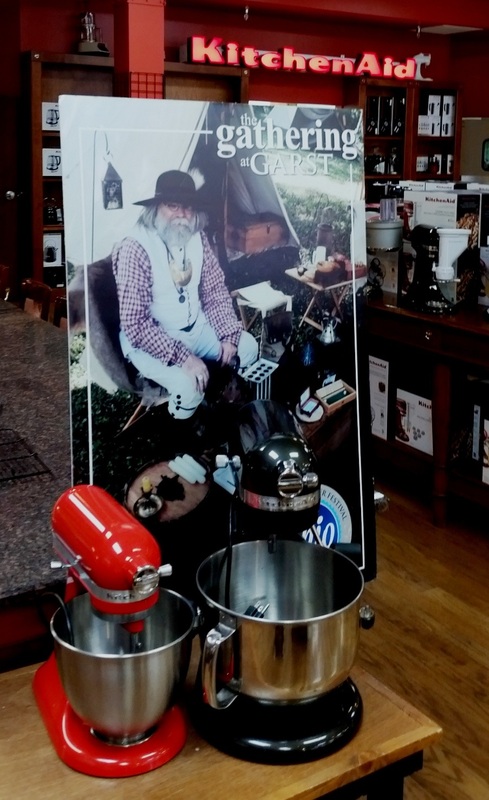 Garst Museum is extremely grateful for the support received from KitchenAid. MARIA STEIN, Ohio (August 13, 2018) – On August 26 the Maria Stein Shrine will host a St. Monica Prayer Service for those who have strayed from the faith, just as she prayed for the conversion of her son, St. Augustine. The prayer service will include scripture reading, reflection on the life of and prayer with the relic of St. Monica. Refreshments will follow the service. Many Darke County families have fond memories of the Darke County Fair. Because the fair is an integral part of the county’s culture, the Garst Museum has documented the history of the Great Darke County Fair in its newest exhibit. The exhibit is a photo collage of fair activities, entertainment, advertising, horseracing, and much more. The fair has been a place to visit friends, show animals, ride the rides, eat the food and enjoy the entertainment. As the county seat, Greenville was selected for geographic reasons. Over the years, the fair has grown into one of the premier county fairs in Ohio. Although much has changed over the years, the fair continues to be a summer highlight that brings people together from far and wide. Be sure to stop in the museum to see this new exhibit. Who knows, you might be in it! The upcoming installment of “Art at the Mill” on display from August 31 through September 23 will feature intriguing mobiles by Dayton-area architect Terry Welker along with the dynamic abstract paintings of his friend and art partner Ron Rollins, who since 1986 has worked as a writer and editor at Dayton Daily News. This exhibit in the Clark Gallery at historic Bear’s Mill opens on the Final Friday of August with a reception from 6 p.m. until 8 p.m., offering finger food and drinks as well as brief talks by the artists who will share information about their work, methods, and inspiration at 7 p.m. “Art at the Mill,” curated by Jan Roestamadji and Julie Clark, is free and open to the public. According to Ms. Clark, Mr. Welker’s fascinating mobiles, inspired by the natural world, will animate the Mill space with their form and motion. “His simple, yet elegant designs of all sizes use curves, arcs, and lines to draw three-dimensionally in space, delighting the eye and the spirit,” Ms. Clark stated. Ms. Roestamadji says that Ron Rollins’ highly colorful paintings inspire happiness, evoking joy in the viewer. "Ron's bold, strong, and freeing acrylic paintings have garnered a following among art enthusiasts of every genre. I am thrilled that the work of these exceptional artists who share a studio in Kettering will enliven our Clark Gallery, and hope that viewers will be inspired to consider enlarging their own collections with their outstanding work." Ron Rollins says that he tries to capture and convey the magic of a single moment in his highly gestural and spontaneous work which pays tribute to the great abstract expressionists of the twentieth century. He is also influenced by the work of his mother, Barbara, a well-known watercolorist; however, his vivid colors highlighted by bright splashes of paint are distinctly different from the realistic work of his mom. “I tend to paint right out of the tube, mixing colors directly on the canvas. I’ll very quickly throw, squirt, smear, smudge, spatter and flick paint to create a scene that expresses motion, light, and energy,” he explains. His works are often untitled, because he doesn’t want his thinking to crowd out other interpretations, and takes pleasure in discovering new perspectives of his work provided by viewers. Building on the tradition of iconic mobile artist Alexander Calder, Terry Welker creates his work by experimenting, using trial and error to allow form to emerge. “Making mobiles comes from my passion for architecture, poetic space, and meaningful places,” he said. After completing his graduate work at the University of Cincinnati in 1987, the architect/artist continued teaching design and drawing at UC for several years; his teaching background and architectural knowledge inform his work which enhances many public spaces throughout Ohio and beyond. His most recent major installation is the highly acclaimed “Fractal Rain,” at the new Dayton Metro Library; composed of five-miles of stainless steel wire, Swarovski crystals, and one-third mile of extruded acrylic prisms, the piece beautifully fills the library’s atrium with the movement of driving rain. Striking mosaics crafted from slate and stone by Cincinnati area artist Peggy Schuning and rustic hewn stone pieces created by Harold Wiley remain on display at Bear’s Mill through August 26. “Art At the Mill” is funded in part by a grant from Darke County Endowment for the Arts. Historic Bear's Mill, owned and operated by Friends of Bear’s Mill, is located at 6450 Arcanum-Bear's Mill Road about 5 miles east of Greenville; current hours of operation are Sundays 1 p.m. to 5 p.m., and 11 a.m. to 5 p.m. Tuesdays through Saturdays. For more information, contact Bear's Mill at 937-548-5112 or www.bearsmill.org. Welcome to the 2018-2019 school year. Our administration and staff are eager to begin another year with the students, parents, grandparents, and community members throughout our district. We hope to have everyone work together to make this another successful instructional and enjoyable year for all. This fall our district will participate in two approved waiver days. These are non-instructional days for students that allow for additional professional development for our staff. These two waiver days will take place on Monday, September 24, 2018 and Monday, October 29, 2018. Parents can coordinate now for these two days the students will not be in session. The staff will be participating in professional development related to the new curriculum mapping, upgraded instructional technology, Twenty First Century teaching skills and updated safety training. All these sessions will promote a current curriculum and safer environment for our students. The district has almost completed the abatement and demolition of all our older buildings. Woodland Heights has now been closed/sold to Greenville Township. The Junior High parking lot and green space is almost complete. The parking lot is now open to public use. The district is also coordinating to sell both the old East and South school grounds using Midwest Auctioneers and Realty, Inc. services. The auction is tentatively set for Tuesday, September 25th at 6:30 p.m. in the Anna Bier Civic Room. The district would like to highlight the Greenville High School FCCLA program for earning the following awards during National Competition in Atlanta, Georgia during June/July. These include: 2nd place – Laura Fields and Taryn Cooper in Advocacy; 3rd Place – Maddie Shepard in Digital Stories; 4th Place – Hayley Zeller in Interpersonal Communications; and 5th Place – Brooke Stachler, Mackenzie McMiller, and Alexa Snyder in Digital Stories. They brought home 4 gold medals, 5 silver medals, and a 2nd, 3rd, 4th, and 5th place overall. You are all a source of pride for Greenville City Schools. Congratulations to Amy Schoen for her instructional leadership of this program. I would like to share some facts about the upcoming 2.0 mill permanent improvement renewal levy. On both May 17, 2018 and June 21, 2018, the Greenville City Board of Education unanimously approved resolutions to place a 2.0 mill permanent improvement renewal issue on the November 6, 2018 ballot. The Greenville City Schools Board of Education has utilized a permanent improvement levy since 1989. This permanent improvement levy has been renewed by the school district voters ever since. Funds generated from this levy can only be used for improvement to buildings and grounds, equipment purchases such as technology, computers, textbook purchases or other assets having an estimated life of 5 years or more. Other examples would be roof repairs, window repairs, parking lots, boilers, track resurfacing, turf replacement, classroom carpeting, new bleachers or additional pole lighting. Permanent improvement monies cannot be utilized for salaries and benefits or consumable items. This 2.0 mill permanent improvement renewal issue would result in NO NEW TAXES and would continue to provide the district with an annual amount more than $450,000 for building improvements. The issue is a request to renew an existing levy and will result in NO additional millage. The issue will cost you no more than you pay today. School buildings are a major investment that require ongoing maintenance and upgrading. The Board of Education continues to operate within the constraints set forth by the permanent improvement budget and demonstrate prudence and accountability with your tax money. If you have any questions about the levy or any other school issue, don’t hesitate to call the Superintendent/Treasurer’s Office at 937-548-3185 from 8:00 am to 4:00 pm. This year the board of education and district has made a conscious effort to improve and provide additional guidance and counseling and social skills support. The district has added an additional K-8 guidance counselor and continued a previous community connections social skills program that was previously funded by an Ohio Department of Education grant. This year the board of education felt it was important to continue this mentoring program at the middle and high school level another year by funding the program, although the grant was discontinued. Remember, the entire Greenville School faculty and staff is here to assist you – our students, parents and community. If we can be of assistance, please feel free to contact our principals or myself. I can be reached by phone at 937-548-3185, or by email at dfries@gcswave.com. Let’s all work together to make 2018-2019 an outstanding school year and keep Greenville Schools a great place for students to learn and teachers to teach. While most of the beer styles in the American craft brewing scene are based on European styles from Belgium, England, Germany, the Czech Republic, and elsewhere, a number of styles have developed on their own right here in America. In the 19th and early 20th centuries, innovative brewers worked with the unique ingredients available to them to develop quintessentially American beer styles for a thirsty public. In this upcoming class in our Craft Beer Education Series at the Greenville Public Library, we'll look at some of these American beer originals, most of which developed prior to Prohibition. The Craft Beer Education Series is lead by Certified Cicerone David Nilsen. David will guide attendees through a tasting of five craft beers, explaining the history and unique ingredients and brewing processes of each. Dates for this class are Thursdays August 30th and September 6th (same class each night). Craft Beer Education Series classes are free, but seats are limited and registration is required. Please call Greenville Public Library at 937-548-3915 to reserve your seat. We hope to see you there!" 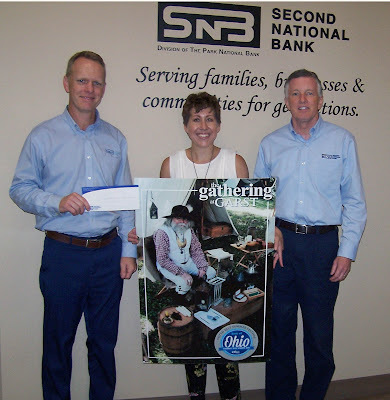 Second National Bank has a long history of supporting many organizations, events, and projects in our community. Garst Museum would like to thank Second National Bank for its continued support of The Gathering at Garst. This July, The Gathering at Garst drew approximately 15,000 people. 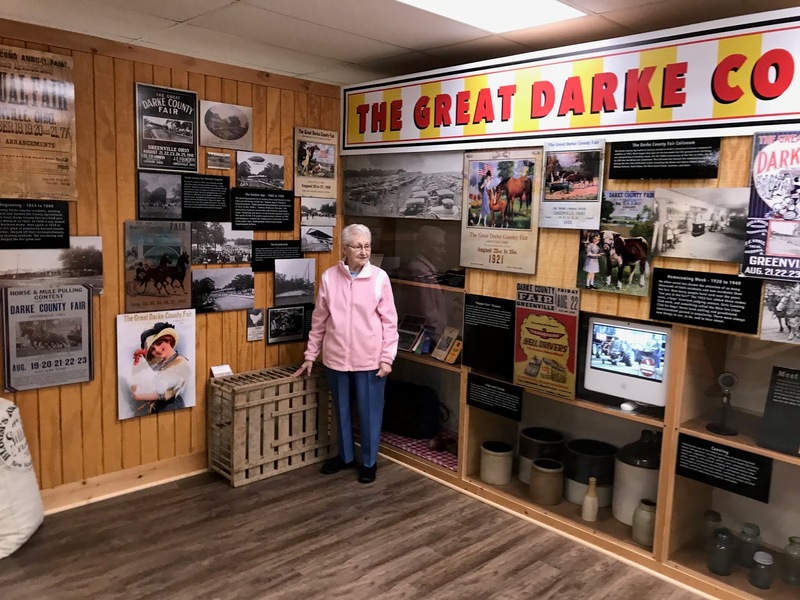 With the generosity of sponsors like Second National Bank, the event continues to grow and bring visitors eager to learn about Darke County and its history. Our community is fortunate to have a bank that gives back in so many ways. The use of herbs in cooking adds color to your dishes. Herbs also add flavor to foods without increasing salt, fat or sugar contests. 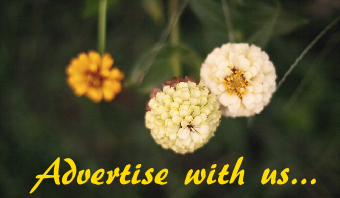 To preserve herbs for extended use by freezing or drying join OSU Extension, Darke County for a program on Freezing and Drying Herbs. The program is Monday, September 19, 2018 from 6:30pm-7:30pm at the OSU Extension Learning Center, 603 Wagner Avenue, Greenville OH. 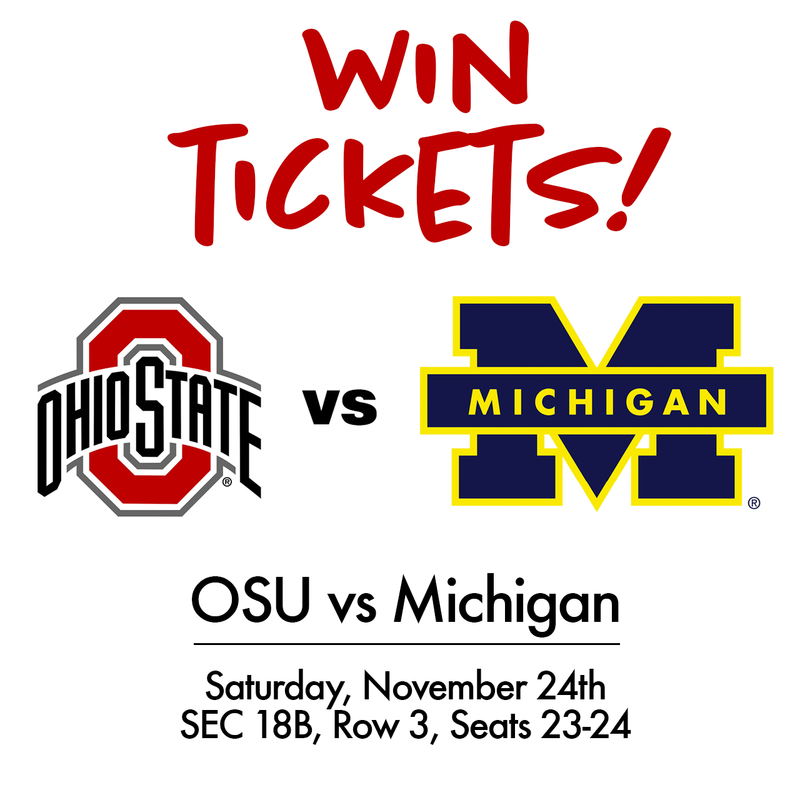 Please call 937-548-5215 to register or email barga.8@osu.edu. The program is free, but please register by Thursday, September 6, 2018. Submitted posts are welcome and encouraged. If you have something to say and are able to do it in a respectful, reasonable way, send your piece to darkejournal@gmail.com. The contents of submitted posts do not necessarily reflect the opinions of DarkeJournal.com. I voted for and today support President Trump even more than when I cast that vote. Because, when President Trump says “promises made, promises kept” he isn’t lying. The promises he has kept during his short term in office have made me wonder if some of the other Presidents were even really trying! He has a wonderful ability to do things other presidents have only talked about. Our economy is booming under his leadership. But there is even more to do to help American industry that fits perfectly with President Trump’s “America First” policy outlook. The Montreal Protocol is an agreement created under another great Republican president, Ronald Reagan. The Kigali Amendment is a proposed addition to the Montreal Protocol which would benefit both the environment and the economy. This amendment would increase the manufacturing exports of the USA by $5 billion dollars, while reducing imports by $7 billion. Math like that sounds like a great plan to me! Approving the Kigali Amendment would create 33,000 manufacturing jobs, especially in the Heating, Ventilation, Air Conditioning, and Refrigeration industry (or HVACR). The Ohio Manufacturing Association recently published a report stating its manufacturing sector ranked third in the nation in 2016 and accounts for 17% of GDP. Ohio is a strong manufacturing state and we should embrace policies such as Kigali to continue our state’s success and continue to promote economic recovery. Approving Kigali would create even more jobs and boost our economy further. When I stated the Kigali Amendment would benefit both the environment and the economy - please know that while the Kigali Amendment is an environmental policy in nature, at its core it is a statement about trade and our economy. Keeping in step with President Trump’s “America First” platform, Kigali evens the playing field and puts American workers first and foremost. For this amendment to be added to the Montreal Protocol, President Trump must send it to the Senate for consideration. There has already been a group of 13 Senators who have sent a letter to the President, urging him to submit the amendment for advice and consent. Not surprisingly, Senators on both sides of the aisle understand the importance of the HVACR industry for our country and want this amendment ratified as soon as possible. One of the bigger reasons President Trump is so popular among Republicans is he knows the middle class has been getting economically squeezed and, based upon his performance to date, we believe him when he says he's going to take a hard look at trade deals harming American workers and that middle class. Promises made, promises kept. President Trump has done some amazing things for our economy and sending the Kigali Amendment to the Senate for consideration would continue to keep his promise to protect the American worker and boost the economy. You may help by contacting your Ohio Senators and ask them to support the Kigali Amendment. The Darke County Sheriff’s Office has received reports of a telephone scam in the Darke County area today. This type of scam has been going on all around the country for sometime and seems to be perpetrated in this area periodically. 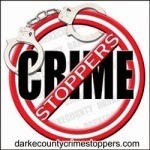 This particular telephone scam involves the perpetrator identifying himself as Chief Deputy Mark Whittaker of the Darke County Sheriff’s Office to obtain money for failing to report for jury duty. In cases such as these the suspect will utilize the name of someone from the local community they are calling. This is an attempt to legitimize the scam. The fictitious telephone number on the caller ID often shows up as a local number in an effort to lure unsuspecting victims. The caller will try to intimidate the victim into complying with the demands. They may try to solicit information to your accounts or ask you to wire money. When the victim refuses to comply or questions the legitimacy of the call it is followed by threats of arrest. Deputies do commonly make phone calls to follow up on investigations and reports. A deputy will never ask you for money. If a person questions the validity of a deputy’s call they will often be asked to call back on our publicly known telephone number 548-2020 and ask for the deputy who will then take the call. 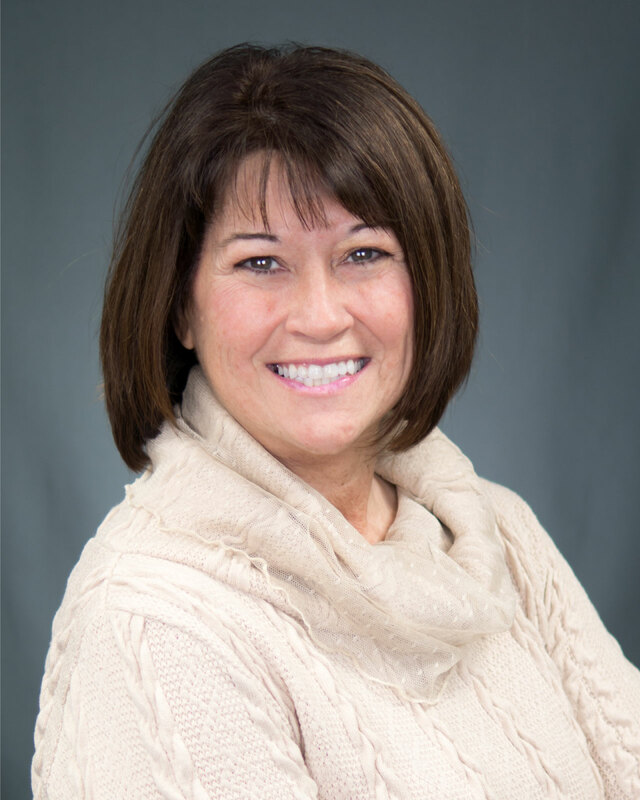 Greenville, OH: Kristina Heath, co-owner of KTL Performance Mortgage, has joined the Main Street Greenville Board of Trustees. The goal of Main Street Greenville is to preserve and revitalize downtown Greenville, Ohio. The organization promotes historic preservation and economic development, resulting in a cultural downtown district that attracts and retains businesses and entrepreneurs, making downtown a desirable destination. Main Street Greenville hosts many programs and events, including First Fridays, Farmers’ Markets, the Hometown Holiday Horse Parade, downtown clean-up events, and much more. 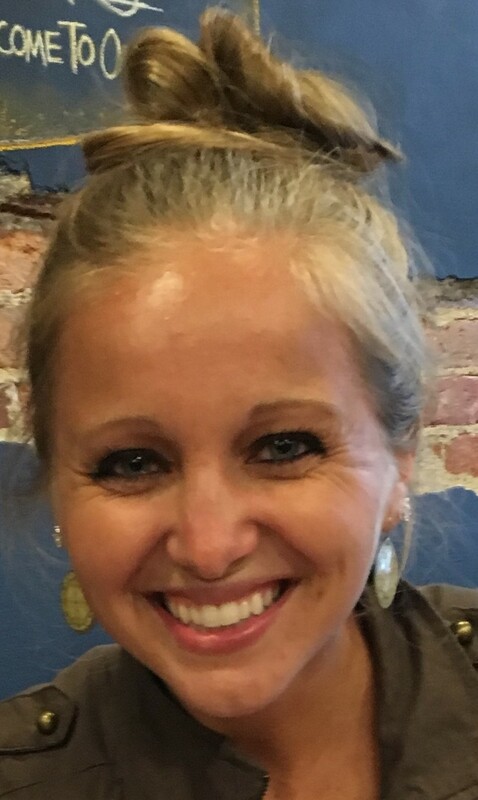 Crysta Hutchinson, Executive Director of Main Street Greenville, remarked "We are thrilled to have Kristina Heath joining our Board of Trustees! Our board members are people who are passionate about their community and prioritize making Greenville a great place to live and work. Kristina is a high-energy, positive person and her creativity and vision are a welcome addition to our organizational leadership." MARIA STEIN, Ohio (August 13, 2018) – On Thursday August 9th the Maria Stein Shrine of the Holy Relics hosted over thirty children for their Summer Day with the Saints. This was an opportunity for children to learn more about the communion of saints through prayer, activities, and crafts. The day began with morning prayer in the relic chapel and ended with lunch. Activities for the day included paper flower making and rosary book decorating, through which the children discovered the witness of St. Rose of Lima and St. Dominic. The children also learned about St. Stephan’s martyrdom with a water balloon toss and St. Christopher’s story with a game of “Jump the River.” Other activities included making cards for elderly loved ones and God’s eyes to learn about St. Jeanne Jugan and St. Kateri. The day also included a saint walk, where children prayed with and learned about popular saints for their local community. July has certainly been an interesting month in the Commissioner’s office! It seemed like every day there was a new challenge to deal with! The weather and the coming recess of the legislature in Columbus have certainly played havoc at times with everyone’s plans. Hopefully things will clear up in the future. Commissioner Stegall took a young man from CGI, the company who does the videos for our website, around Darke County for an upgrade to the videos done 5 years ago; it is hard to believe it has been that long! This is in conjunction with an upgrade in progress for our overall website. We will let people know when the videos are posted. Parades have been the order of the day for the last 2 months. Weather and good crowds have made these events a lot more fun for the elected officials. Thanks to the Parade committees for always inviting us to attend. If you would like to have the elected officials in your parade, just let us know about a month before your event so we can arrange to have as many as possible attend. In other news, we have several projects, either starting, in progress, or in final planning stages. The Airport project is in progress, and is moving along as good as possible considering the weather and a few problems with the asphalting part of the project. It seems our July 26th completion date has been moved back a touch due to weather, extra work at the west end of the runway, and problems with the milling of the asphalt. The runway was started with asphalt being laid on July 9th . Problems soon ensued with the milling aspect, and that is still being worked on at this time. The FAA specs are very strict and must be followed, and this has caused the delay. The various parties are discussing what their options are. Even though the asphalt is not done, the new Precision Approach Path Indicator (PAPI) lights and electrical upgrades have been installed. Once the milling and asphalt are done, then seeding of the graded areas should complete the project. The Dispatch center upgrades at the Sheriff’s office is coming along and our conversion to the MARCS system is now complete. We are working on a few minor problems, and they will be fixed very shortly. We are in the process of moving the Michaels Home for boys into the old vacant County home. This home will allow young men who have home problems, or other minor problems, to have a better place so our staff can work with them. Some concern has been shown that these young men are troublemakers from other counties. The object of the Michaels home is to take young men with problems at home and school that are nonviolent. The more violent young men are sent away and not kept here. We have found there is a definite need for such a place that other counties can utilize as well. This will make a perfect place to enlarge and improve on our current facility. The end of July also sees two of the more attended and anticipated events in Darke County; the Gathering at Garst and Annie Oakley Days. The committees for each event worked very hard to make them a success, and that hard work paid off. Both were fortunate to have great weather and were very well attended. Congratulations to both committees on very successful events! As we have stated the last couple of months, due to our loss of revenue from the state Medicare Sales tax, we have seen losses of about $60,000 a month. We have been watching this since late last year, so it was expected. This does make things far more difficult for 2019, as we are fine for this year. As of now, our budget has been set at a deficit. The budget is a tool to determine what appropriations are projected to look at next year and in November we do appropriations where we actually let our departments know what they can actually spend. Right now, we have told them to expect a 9% reduction across the board for 2019. The legislature in Columbus has seen an increase in their tax receipts and another $657.5 million added to the rainy day fund. With the recent Supreme Court ruling on Sales taxes of internet sales, it is possible we could see some help from Columbus. That would be nice, but we are not holding our breath. We will do what needs to be done, and that does not include raising taxes as many Counties around us have done. July is over and there was a lot going on, with plenty of things to do with your families and friends. While you are out in August, come into one of our public meetings on Mondays and Wednesdays, 1:30 in the afternoon at the Commissioner’s office, 520 South Broadway in Greenville, just south of the Courthouse. Hope to see you there! 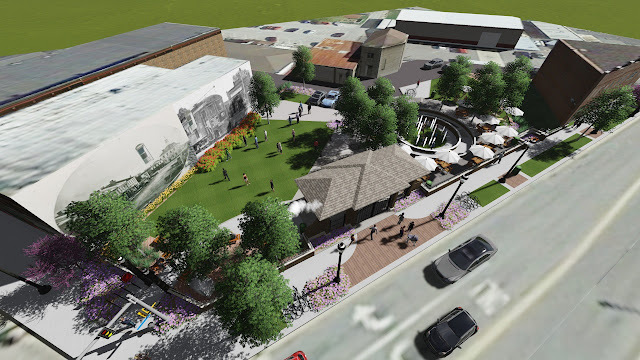 The YOLO organization has raised over $550,000 for the downtown Greenville Urban Park project, and hopes the community will rally to help complete the vision presented in this designers rendering. Greenville, OH - An urban park in downtown Greenville has existed only as a dream and in designers renderings for 5 years. But now that construction has officially begun, the vision presented by the YOLO Organization is finally becoming a reality. Thanks to the tireless efforts of the YOLO Committee members, over half a million dollars has already been raised for the creation of this community gathering place. As the committee reaches the final stages of the fundraising process they are hoping that the community will come together to help support this project and push it over the finish line. Funding for this project has come from several sources, including a $250,000 grant from the Ohio Department of Natural Resources. 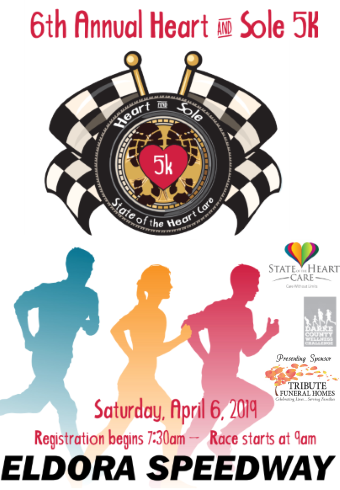 Local supporters include Zechar Bailey Funeral Home, Wayne HealthCare/Foundation, Greenville Federal Bank, Greenville National Bank, Greyson James Steyer Memorial Fund, The Light Foundation, Walls Brothers Asphalt Company, and Financial Achievement Services (FAS), among many others. A full list of park supporters can be found on the organization’s website, www.yoloorg.com/urban-park.htm. YOLO of Darke County is incredibly grateful for every business, organization, and individual who has already donated to this project and thanks to the many contributions received the urban park is 73% funded! The YOLO Committee would now like to open this project up to community support in the form of a crowdfunding campaign. A page has been created on the crowdfunding platform Fundly to allow community members to contribute to the park and be recognized as supporters within the park. To donate to this project please visit www.fundly.com/yolopark. Contributions will be used to purchase high quality furnishings for the park, including items such as tables, chairs, benches, trash cans, and bike racks, that will last for many years with minimal maintenance. Donations of any amount are welcomed and greatly appreciated. Support at any level, from $10 to $10,000 all help to make this dream a reality. If you would like to donate to the urban park project, please visit fundly.com/yolopark. There are options for sponsoring specific park features or, alternatively, custom donation amounts can be entered. If you would like to donate directly to the project to help avoid processing fees, please contact Phillip Pierri at info@YOLOorg.com or 937-371-9088. Y.O.L.O. of Darke County, Inc., founded by Phillip and Jodi Pierri, strives to continuously improve the community while also bringing together high energy people to promote healthy lifestyles and embrace living life to the fullest.The YOLO Community Fund was established with the goal of maintaining a fund that will be able to perpetually give back to the community in ways for which its members will be proud. All proceeds from Y.O.L.O. 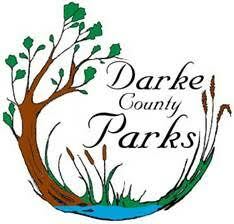 of Darke County, Inc. events will be deposited into this fund. The Y.O.L.O of Darke County, Inc is a non-profit organization and any donation is tax deductible.